Tom Riding reflects on the introduction of Albion Reiver's into the W & J Riding fleet. "Except for an early Albion Chieftain in 1955 we had no other Albion in our fleet until the arrival of an Albion Reiver in 1961. The Reiver made good sense to us as it was still the period of the carriers license and the ULW of a vehicle was all important. 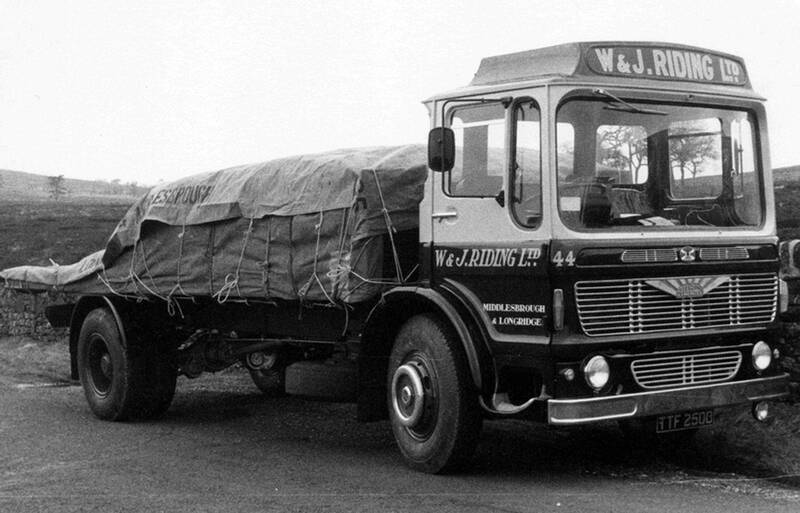 The rigid Leyland Beaver was 5 ton 15 cwt unladen and could legally carry eight tons were as the Albion Reiver with an ulw of 6 ton 10 cwt could carry twelve and a half tons which made economic sense. The draw-bar trailer off the Leyland Beaver at three tons ulw could be moved up to four tons ulw which would allow you to use a Leyland Comet in its place but all this was subject to applying to the authority to facilitate these changes. We only had five Albion Reiver's in our fleet with the first two Model Re25's having air /hydraulic brakes while the last three, Model Re29's, had full air brakes which were far superior. In 1965 we chose to buy the tilt cab Super Albion Clydesdale due to the fact that it became available before the Super Comet with this type of cab, simple as that. We had the first built Super Albion Clydesdale that came off the production line at Scotland where i personally travelled to and collected it myself in 1965". Albion Chieftain four wheeler Reg No UTC 899 was purchased brand new in 1955 shortly after de-nationalisation. 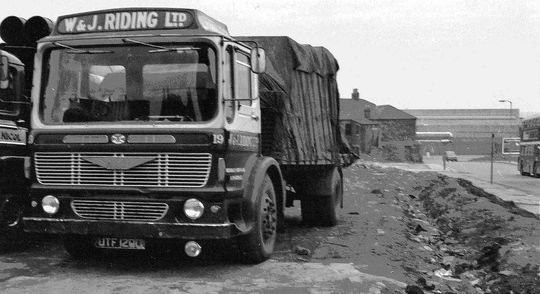 This machine was fitted out as was normal at that time with a Fowler of Leyland cab and body. 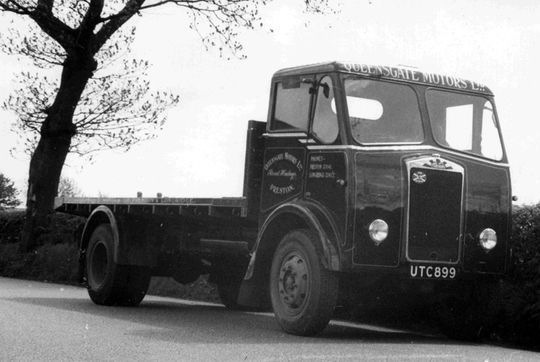 Driven by Ken Lancaster it was on similar work to an 'S' Type Bedford four wheeler operated by Riding's at that time but was only retained on the fleet for five years. 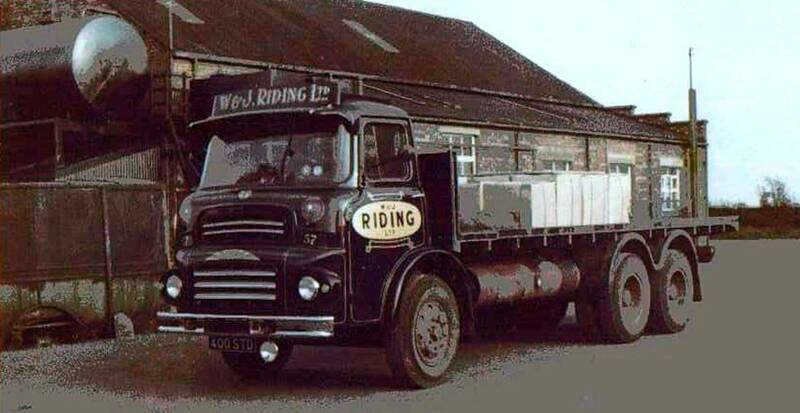 Registered new to Riding's in 1961 Albion Riever RE25 six wheeler flat Reg No 400 STD Fleet No 57 was driven from new by the late Harry Margerison. "This was our first Albion Riever with a 20 foot body and air over hydraulic brakes. It was also our first experience of the Leyland 400 engine and in those early days they could pull the cylinder liners down into the sump for fun but eventually Leyland did solve the problem also notice what was our first attempt at the gold roundel livery on the doors". 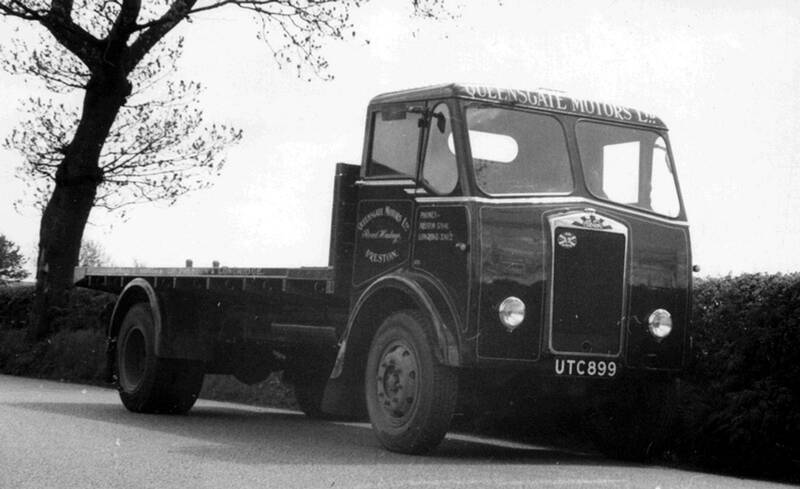 Albion Riever RE25 six wheeler flat Reg No 500 UTC Fleet No 58 was driven from new by the late Donald Thornton. This particular Riever was fitted with air over hydraulic brakes while this and subsequent Reiver's all had 24 foot bodies. "This particular machine must have been a late Friday afternoon build at the factory because it was absolutely plagued with trouble it's entire life while in our fleet". Albion Riever RE29 six wheeler flat Reg No 670 WTD, new in 1961, was one of five Albion Riever's in the fleet at that time. "These vehicles had full air brakes which were ok and much better than the first two RE25's which had air over hydraulic brakes. This particular machine had been sent back into Leyland experimental dept in 1965 were it was fitted with a Leyland designed and manufactured rotary fuel injection pump. As i remember it wasn't a great success as it used to open itself up and start smoking and in fact it got a GV 9 coming out of Gateshead for this very reason. It was eventually taken off the engine and the project came to an end. Our old fleet engineer still has the original rotary pump". 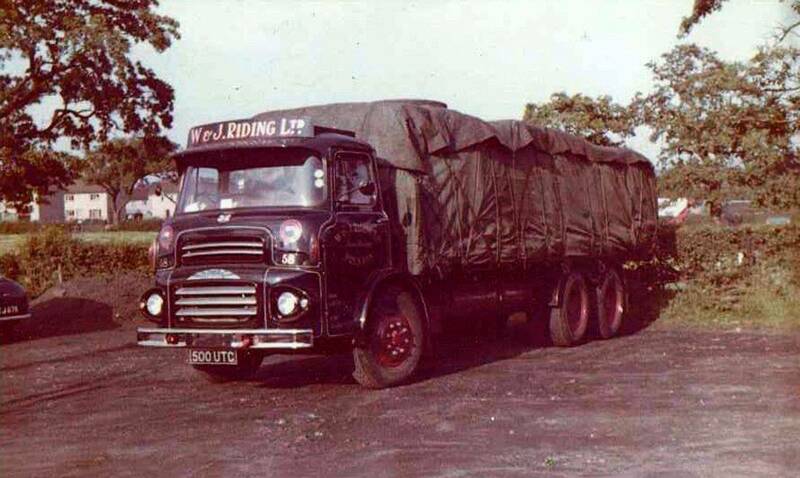 Another shot of Albion Riever RE29 six wheeler Reg No 670 WTD Fleet No 60 which was registered new to W & J Riding in 1961. 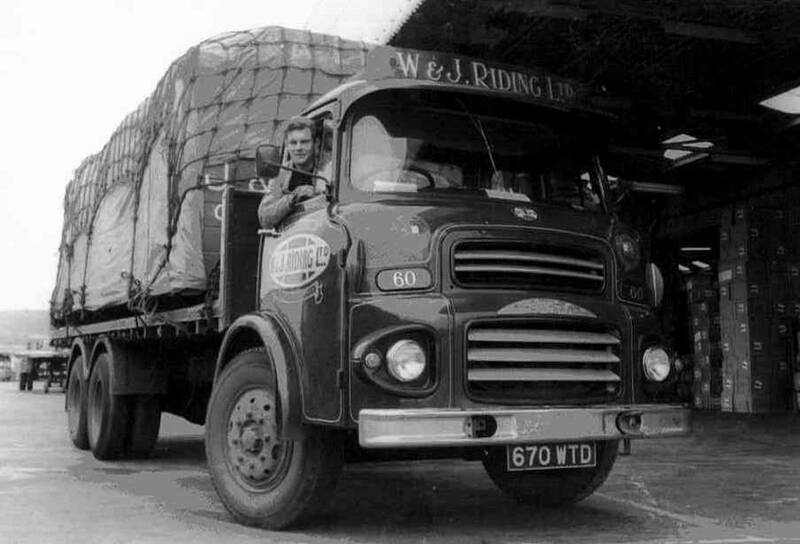 It is seen here after loading up at the ICI warehouse at Marske on Teesside with Alan Hall pictured at the wheel. Pictured here parked up in the depot at Longridge in 1962 is Albion Riever RE29 six wheeler flat Reg No 700 XTB Fleet No 33. This was another one out of a total of five Albion Riever's in the Riding fleet at that time note the long range fuel tank. 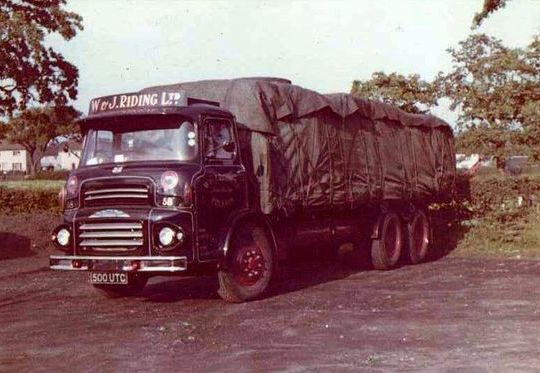 Super Albion Clydesdale four wheeler Reg No RTE 770C Fleet No 38 was the first 16 ton rigid Albion with a tilt cab to enter service with the fleet. 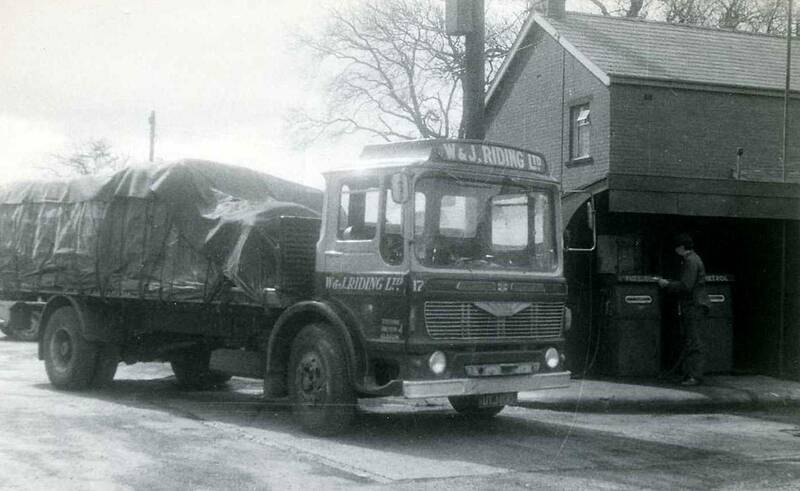 Registered new on the 1st of October 1965 the chassis/cab cost £2,400 from Gilbraith Commercials of Chorley. Powered by a Leyland 400 engine Tom Riding collected it in person from the Albion factory in Scotstoun. After six years service RTE 770C was sold on the 21st of December 1971 for £700 plus vat to an ex Riding driver by the name of Mr Ken Lancaster who traded as K & L Transport of Garstang. 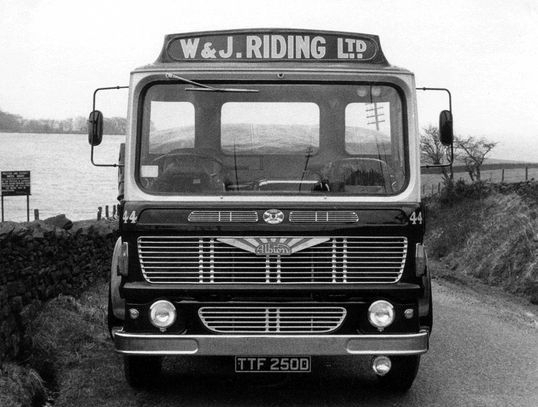 Super Albion Clydesdale four wheeler Reg No TTF 250D Fleet No 44, driven by Harry Dinsdale, is pictured here when brand new in 1966. When the law changed to 16 tons on two axles Riding's could at last carry 10 tons legally with ease. 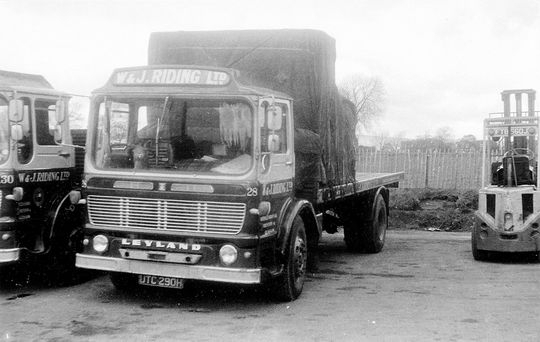 During 1966 a number of these Super Clydesdale's started to arrive as Albion came out with the Ergomatic cab before Leyland launched the Ergomatic on their Super Comet. A close up shot of Super Albion Clydesdale four wheeler Reg No TTF 250D Fleet No 44 on it's very first trip out. 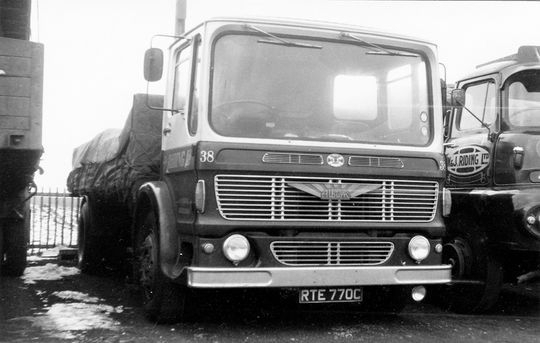 Pictured here when brand new in 1966, and driven by Harry Dinsdale, it was one of a number of Albion Clydesdale's introduced into the fleet that year. 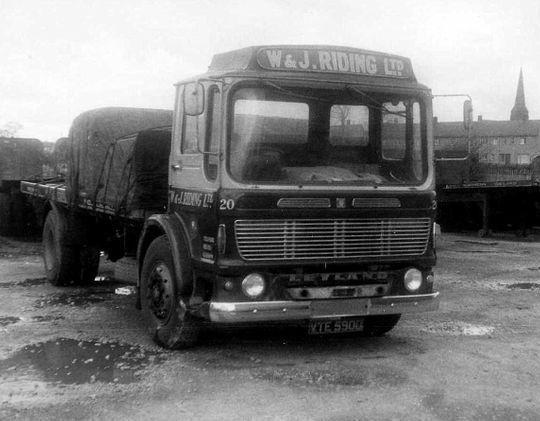 Super Albion Clydesdale four wheeler Reg No UTF 120D Fleet No 19, seen here parked up on rough ground in Gateshead, was driven by Eric Hodgson. The photograph must have been taken in winter, because the late Jim Riding used to cover the chrome bumpers with grease to stop the salt from ruining the chrome plating during the winter months. 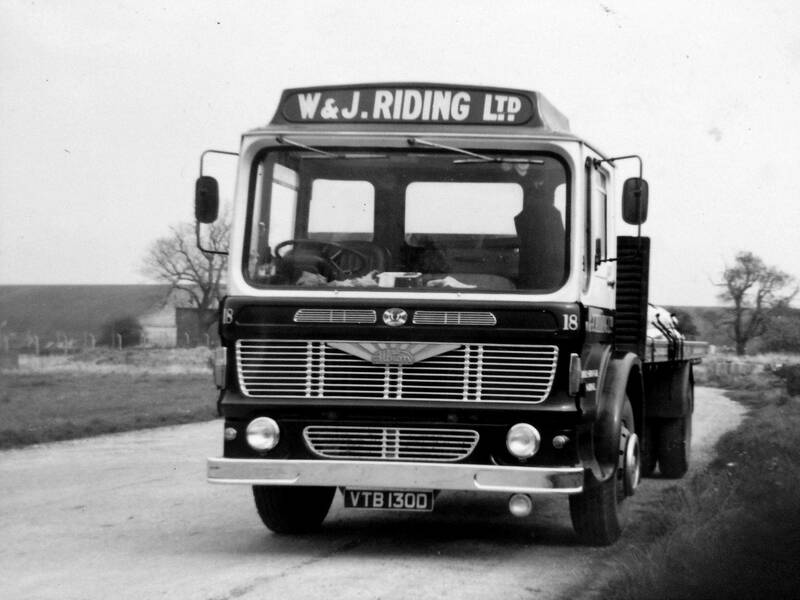 This Albion Super Clydesdale four wheeler Reg No UTJ 110D Fleet No 17 was a brand new addition to the fleet on 15th March 1966 at a cost of £2,674. It originally came with a 19ft 6in wheelbase but was shorted in Riding's own workshops down to a 16ft wheelbase, with a 24ft overhaul body. After being in service with Riding's for just over nine years it was sold on in 1975 for £600. 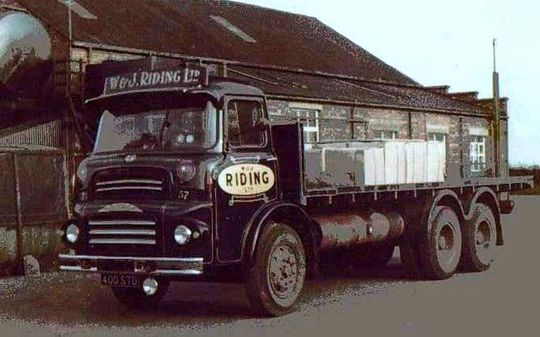 An excellent picture of Albion Super Clydesdale four wheeler Reg NO VTB 130D Fleet No 18. VTB 130D was a brand new addition to the fleet on the 1st of April 1966 at a cost of £2,394 10s and was originally purchased new from Albion as just a basic cab and chassis. After fitting a flat body and painting at Longridge the final on the road cost came to a total of £2,674 4s 6d. 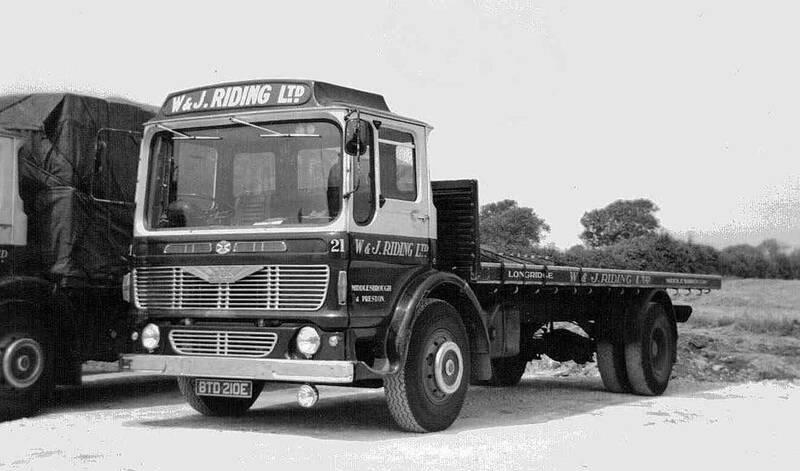 VTB 130D was in service with Riding's for seven years after which time it was sold on to R.J. Wells of Great Ecclestone on the 1st of February 1973 for the sum of £700 plus vat. Albion Super Clydesdale four wheeler Reg No VTE 590D Fleet No 20 was purchased brand new and entered service with the fleet on the 1st May 1966. 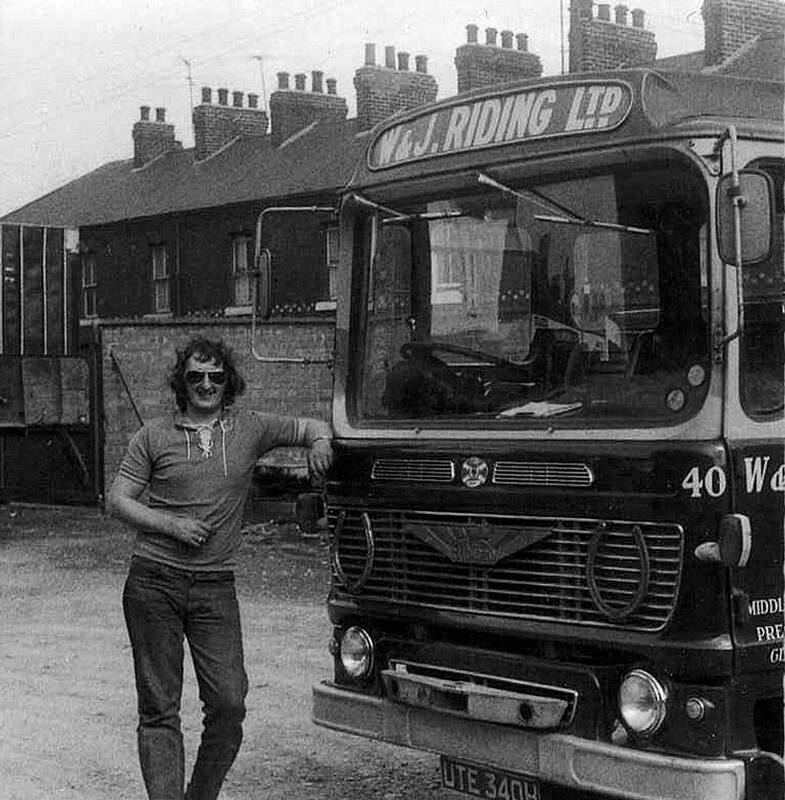 After being involved in a minor front end collision the trade mark Albion front panel had, by this time, been replaced with a Leyland front panel as was the norm due to Leyland panels being more readily available. 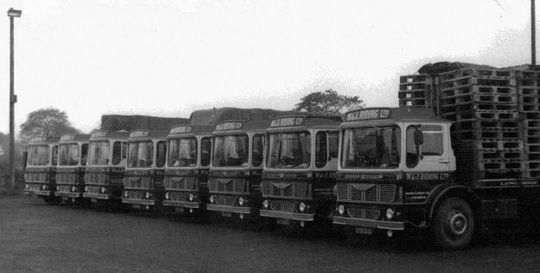 An impressive line up of Five Albion Super Clydesdale's and three tilt cab Leyland Beaver's parked up for the weekend in the yard at Longridge in 1967. Within a short period of time, after this picture was taken, the arrival of the Atkinsons, at the rate of one a month would see an end to Leyland's dominance within the Riding fleet. Albion Clydesdale four wheeler Reg No BTD 210E Fleet No 21 was registered new to Riding's in February 1967 at a cost £2,688 and was one of a number that gave good service over the years. After eight years service it was sold on in March 1975 for £770 to Mr Knight of Fulwood near Preston. This particular photograph was taken by Tom Riding's brother, the late James H Riding, who passed away in February 1993 aged 65. Albion Super Clydesdale four wheeler Reg No UTC 290H Fleet No 28 was powered by a Leyland 0/401 engine in line with an Albion six speed gearbox. 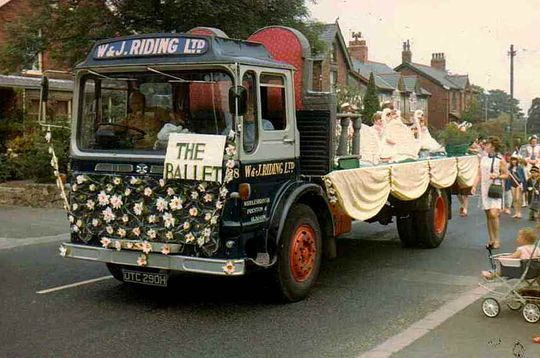 Registered new on the 1st of October 1969 at a cost of £2,581 9s 0d it is seen here in 1972 in a procession during the local Grimsargh Field Day, an annual event which the whole village enjoys. Walking alongside at the rear of the lorry is Tom Riding's wife Margaret who is keeping a close eye on one of their three daughters who was one of the precious cargo. Albion Super Clydesdale four wheeler Reg No UTC 290H Fleet No 28 is pictured here in later days parked in the depot at Longridge. For some reason by now the trade mark Albion front panel had been replaced with a Leyland front panel. Registered new on the 1st of October 1969 at a cost of £2,581 9s 0d it remained in service with Riding's for nine years until it was sold on in August 1977 to local dealer Sydney Hartley for £700 plus vat. Albion Super Clydesdale four wheeler Reg No UTE 340H Fleet No 40 was registered new on the 1st of November 1969 at a cost of £2,854. It is seen here in South Bank yard with driver Jimmy Ashcroft taking time out for a photograph. Note the very classy towing hook that Riding's used to make in house and fit to all their Ergomatic's. 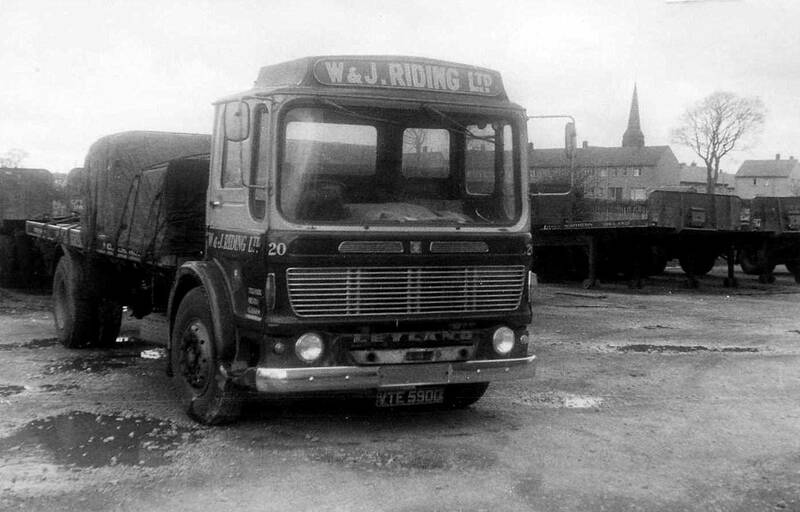 Reg No UTE 310H Fleet No 30 was another Albion Super Clydesdale which was also new on the same day, of which these were the last Ergomatic cabbed Albion Clydesdale four wheeler's purchased by W & J Riding. After eight years service UTE 340H was sold to a Mr Bradley of Preston for the sum of £833 plus 8% Vat.